In which, Captain Robb takes us Pontooning, and a Short Kayak Excursion nearly leaves us Marooned on a Deserted Island. 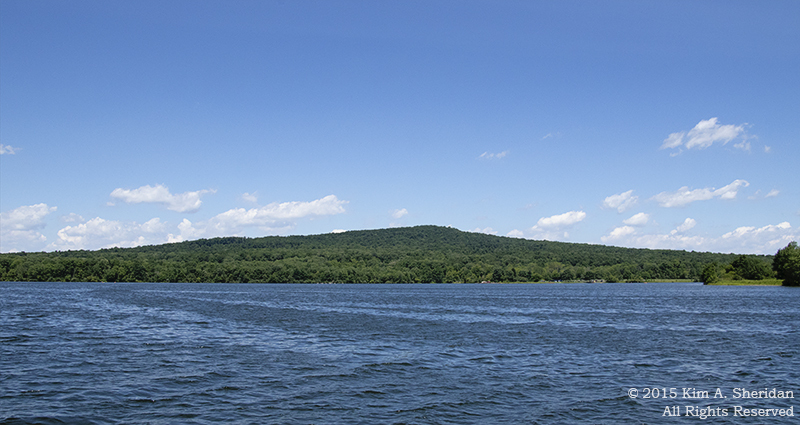 One of our favorite things to do in the summer is to go to Lake Nockamixon and rent a pontoon boat for a couple of hours. 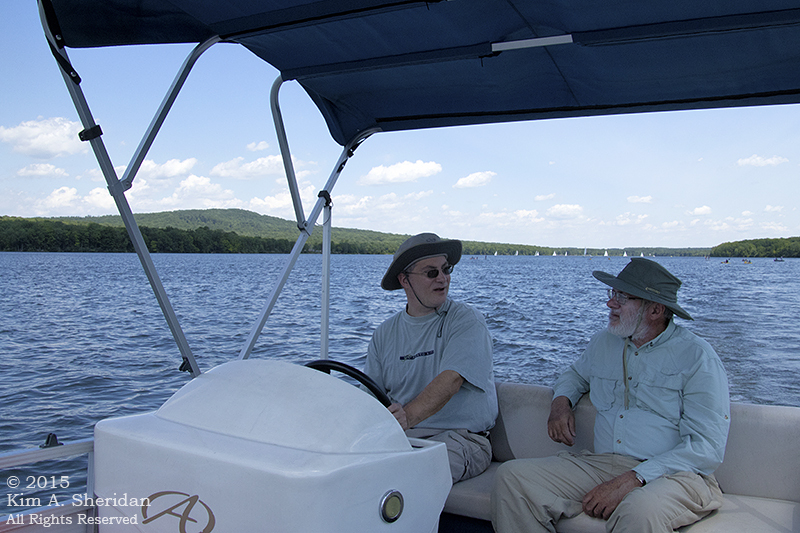 A gorgeous Saturday, blue water, a light breeze, a shady boat canopy; what could be more relaxing? 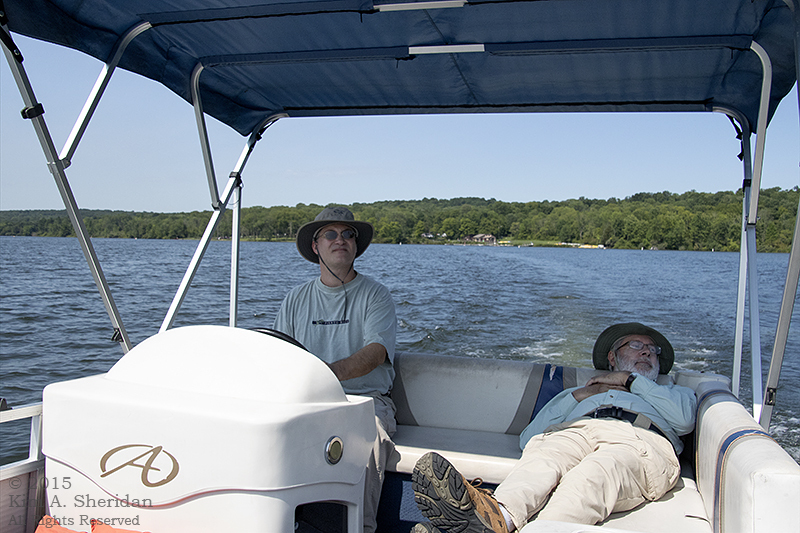 Don was so relaxed he took a little nap, trusting in Captain Robb’s superb piloting skills. 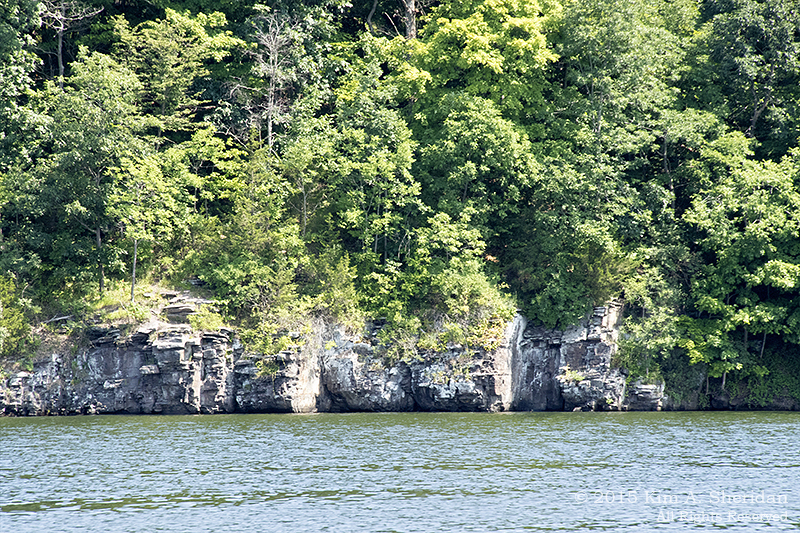 One of the rock outcroppings along the shoreline. 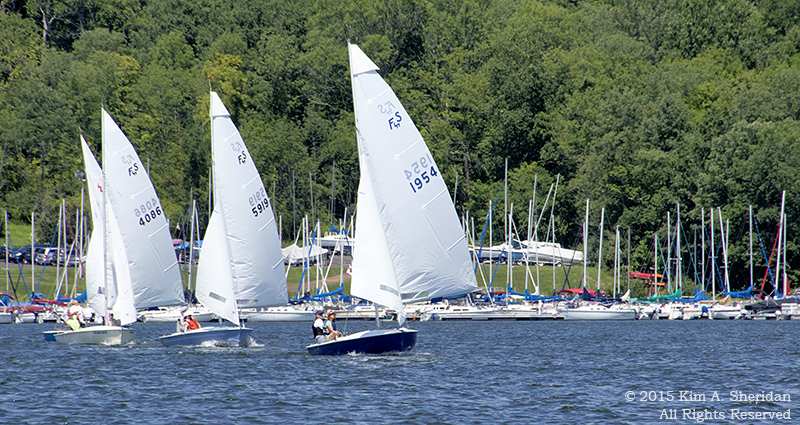 Sailboats in front of the marina. Haycock Mountain. Calling Haycock a “mountain” is a bit of a stretch, in my book. It’s only 960′ in elevation, nothing more than a hill. But it is the highest “summit” in Bucks County. The guys chit-chat away, with Haycock in the background. All in all, it was a lovely day on the lake. Sunday morning we set out on a much-anticipated kayaking expedition, down Darby Creek to the Delaware River and across to Little Tinicum Island. It’s a small uninhabited island about 3 miles long by 500 feet wide. 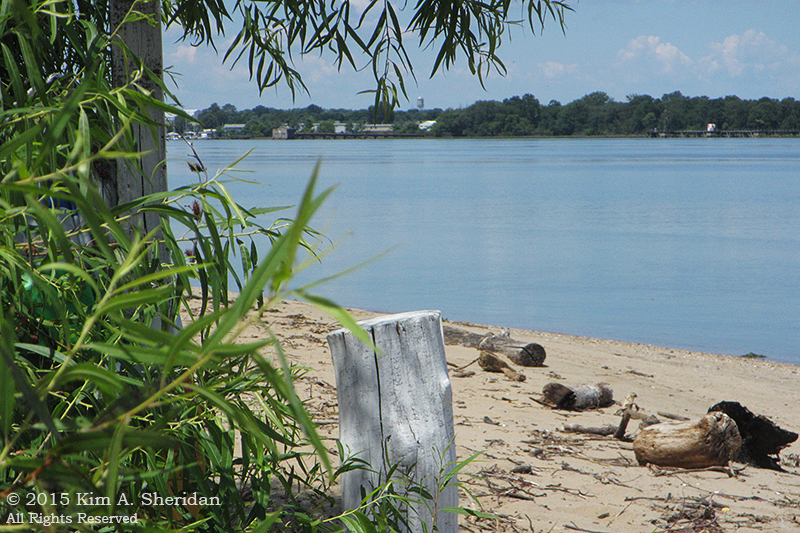 Most of the island is overgrown with impenetrable vegetation, but the shore is lined with narrow sand beaches. We paddled out on a day so calm the water was like glass. 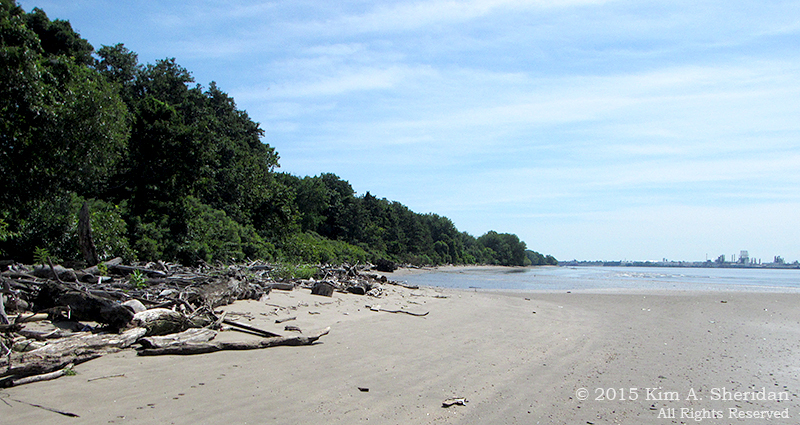 The tide was out, and we were surprised at how shallow the river was. Robb saw a crab swim by his kayak. Here’s Robb and Don paddling around the southern tip of the island. Partway up the New Jersey side, we decided to land. This meant walking across a long stretch of slippery, sticky mudflats while dragging our boats behind us. Yuck! 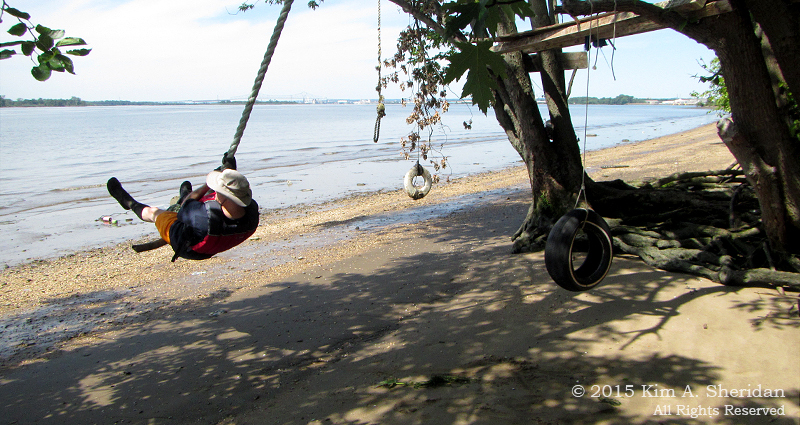 Once we reached the sand, we had a grand time exploring the shoreline. 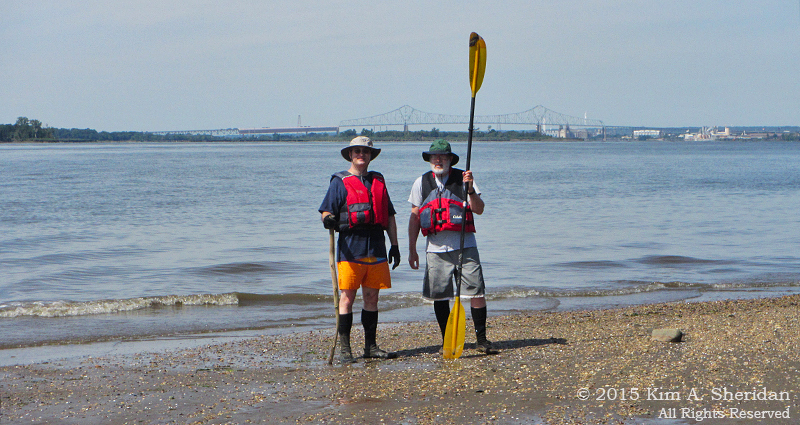 Robb and Don on Little Tinicum Island, looking south, with the Commodore Barry Bridge in the background. We found two cozy little “camps” on the island, one on each side. People had set up chairs, a table, tire swings, even fire rings. Probably fishermen, since each camp had its own skillet. Robb couldn’t resist one of the swings. Really, he’s just a big kid. When we left the Jersey side, there was a large freighter out in the main channel. 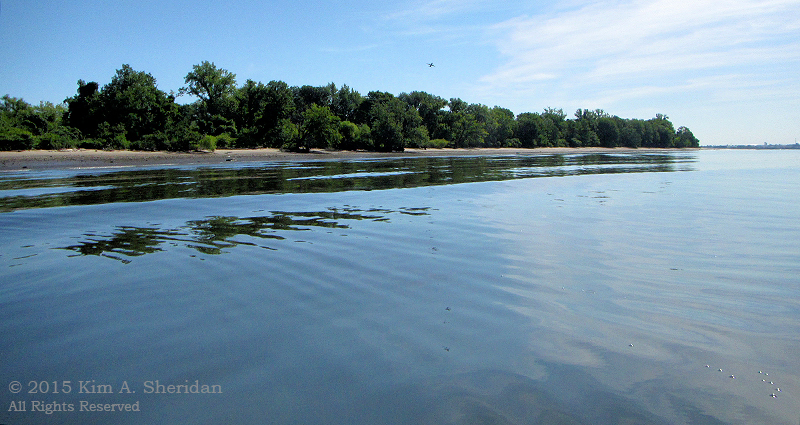 I was back on the water first and glanced back to see the guys sitting in their floating kayaks, ready to paddle away. Then I heard Robb shout something. 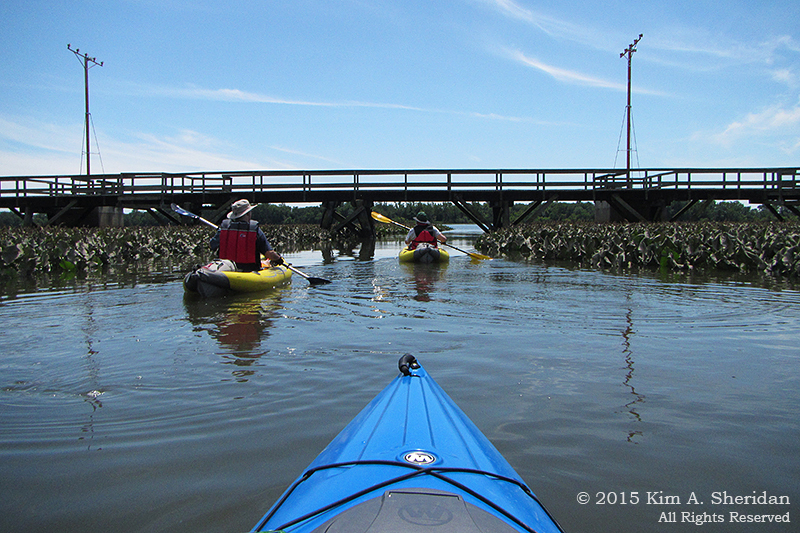 I turned around to see them still in their kayaks, still in the same place – but now high and dry on the mudflats! No water anywhere near them! FUN FACT: Why did the water drain away from the shore? Something called bank suction, created by that large ship that was passing by. The increased velocity of water past the hull of a ship in a restricted channel causes a decrease in pressure which draws the ship bodily toward the near bank. That decreased pressure also draws the water towards the ship. The effect is temporary; the water flows back in a moment or two. Don paddling along the Jersey side of the island, once he’d gotten some actual water to paddle in. 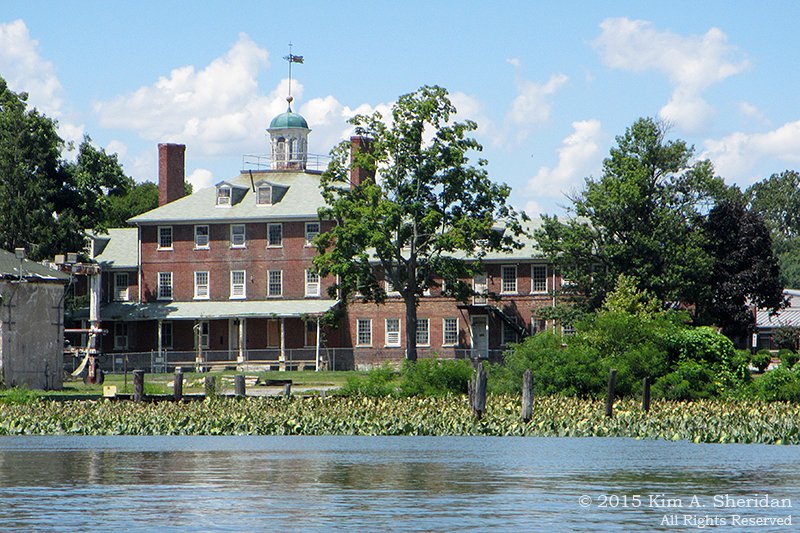 A “lazaretto” or “lazaret” is a quarantine station for marine travelers. The Philadelphia Lazaretto, on the Delaware County shore of the Delaware River, was built in 1799 in response to the 1793 yellow fever epidemic. All ships were required to stop here for inspection, and ill passengers were quarantined. It operated as a hospital until 1895. A century older than Ellis Island’s inspection station in New York, this is the oldest surviving quarantine hospital in the U.S. The view of the building from the river is something a lot of people never see. Not everyone can say they’ve paddled under the runway lights of the Philadelphia Airport, either. These are on a long wooden pier extending obliquely along the shore. Needless to say, there were a lot of planes taking off and flying overhead while we were out on the river. The first three hours of our fateful trip were relaxing and fun. The second three hours, not so much. Tides are tricky things. 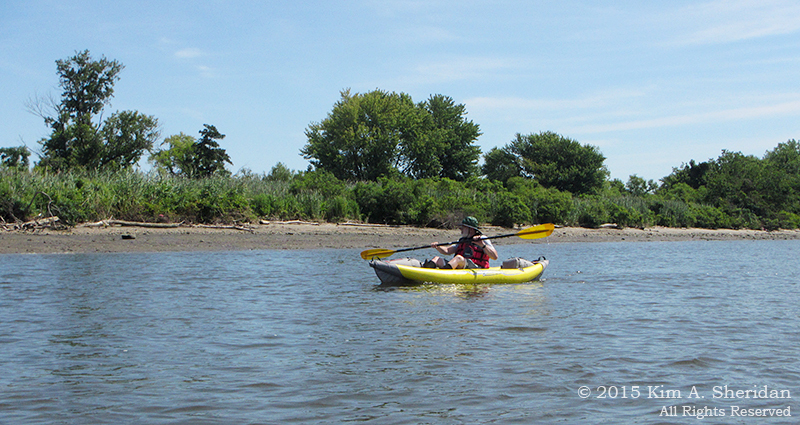 We had only planned to paddle partway up the Philadelphia side of the island, for about 45 minutes. But we reached the north end in 30, thanks to the incoming tide. 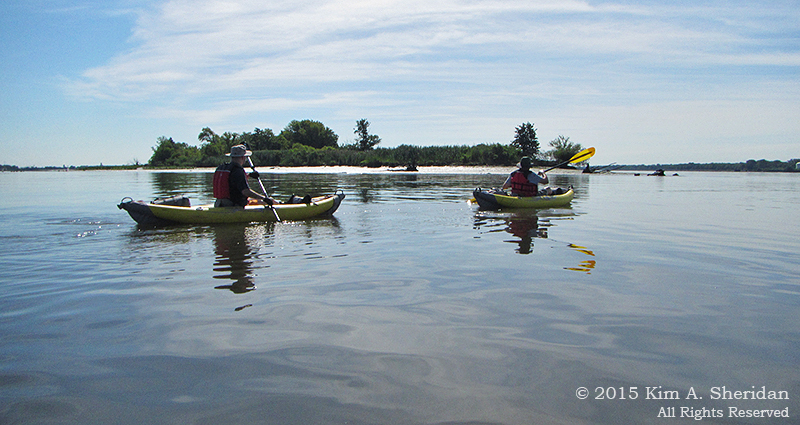 Then it took us over 2 hours of HARD paddling to cover the same three miles against the tide. We seriously underestimated the strength of the flood current. At times we were making no progress at all. And that’s how our three-hour tour turned into a six-hour marathon, and nearly left us castaways on a deserted isle! All in a wonderful watery weekend. 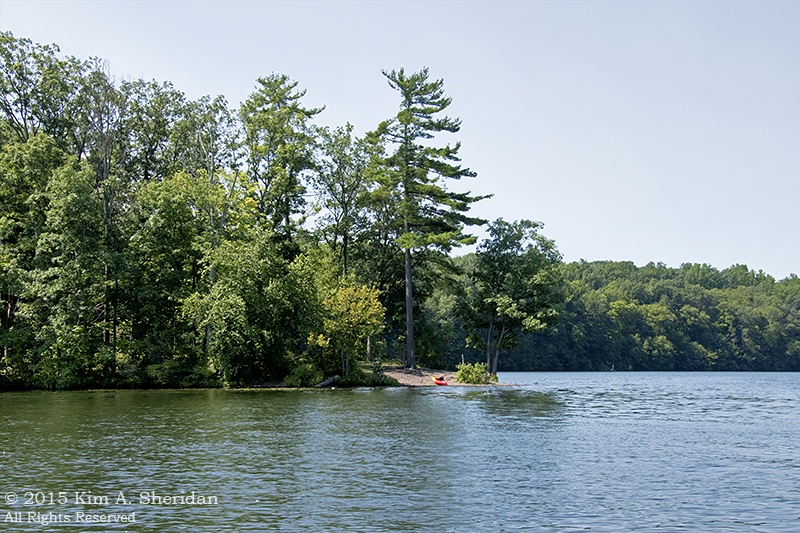 This entry was posted in Kayaking, Nature and tagged Delaware River, Kayaking, Nockamixon State Park by Kim. Bookmark the permalink.